PalmSHIELD is proud to be part of Allentown, Pennsylvania’s first medical marijuana dispensary. PalmSHIELD and their installation partner, ProMax Fence Systems, provided the dispensary’s mechanical equipment screening. The screening faces the front of the building and compliments its unique architecture and color accents. 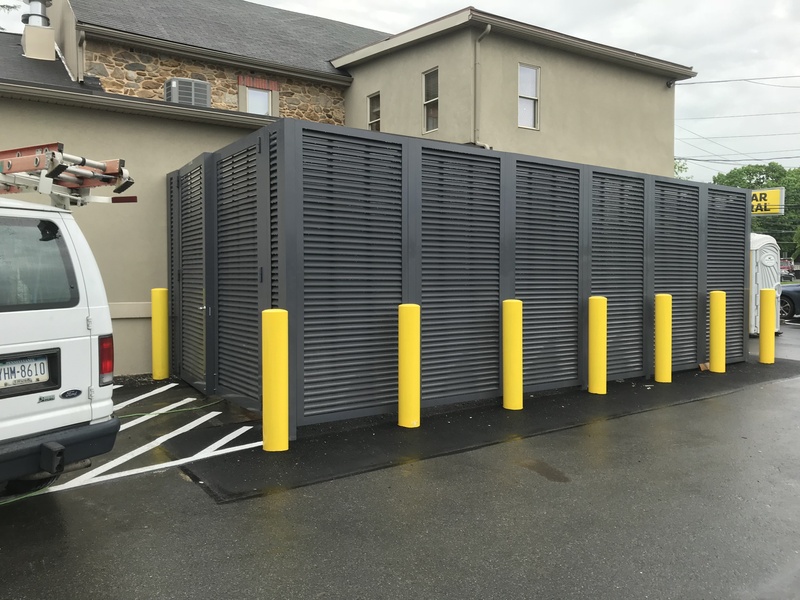 ProMax Fence Systems, Reading Pennsylvania, is a seasoned veteran when it comes to installing the PalmSHIELD horizontal louvered fence system. They have installed the PalmSHIELD product on previous projects. Viewing the finished installation, it quickly becomes apparent that ProMax Fence Systems did a fantastic job. All of the seams are tight and the system aligns level as the ground slopes away. Congratulations to ProMax Fence Systems for doing an outstanding job. This PalmSHIELD project utilized the Gorilla hinges and exclusive internal locking device. Standing at over ten feet tall, there is a large set of double drive gates at the rear of the enclosure. These large gates require serious hinges. PalmSHIELD’s Gorilla hinges utilize a butterfly design with half inch mounting plates with all the bolt holes being pre-drilled and tapped. 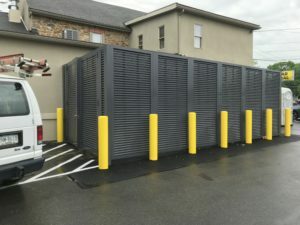 PalmSHIELD is the nation’s leader in mechanical equipment screening, walls and enclosures with our unique fully framed panel designs and the industry’s largest louver. PalmSHIELD provides rooftop and self-standing system solutions. Every screen project is a custom project.